Majority of the Malaysians have rejected Barisan Nasional (BN) in the 13th General Elections (GE13) and yet they still get to retain power and form a new government. That makes the gerrymandering issue in Malaysia more obvious than ever before as this is the first time that the opposition Pakatan Rakyat (PR) had ever won over 50% of the total national votes and still lost in the election. According to statistics (if correct), 8% of the total votes gave BN 23% of the parliamentary seats. But we all already knew from the very beginning that PR were playing in a rigged game. The problem is, on top of that, there were also other fraud allegations as well. We are angry. We feel cheated and robbed. But do we give up? Do we wait for another 5 years? Do we boycott future elections? What do we do now, today, tomorrow and the coming weeks? Where do we go from here? Yesterday night, I went searching for hope, comfort and answers at a public forum that was hosted by BERSIH 2.0 and the KL Selangor Chinese Assembly Hall Civil Rights Committee to discuss about GE13 and whether or not BN is a legitimate government. The panelists were Haris Ibrahim (ABU), Jerald Joseph (KOMAS), Syaraad Kuttan (BFM) and Azmi Sharom (The Star columnist & law professor), moderated by Masjalizah Hamzah (CIJ). 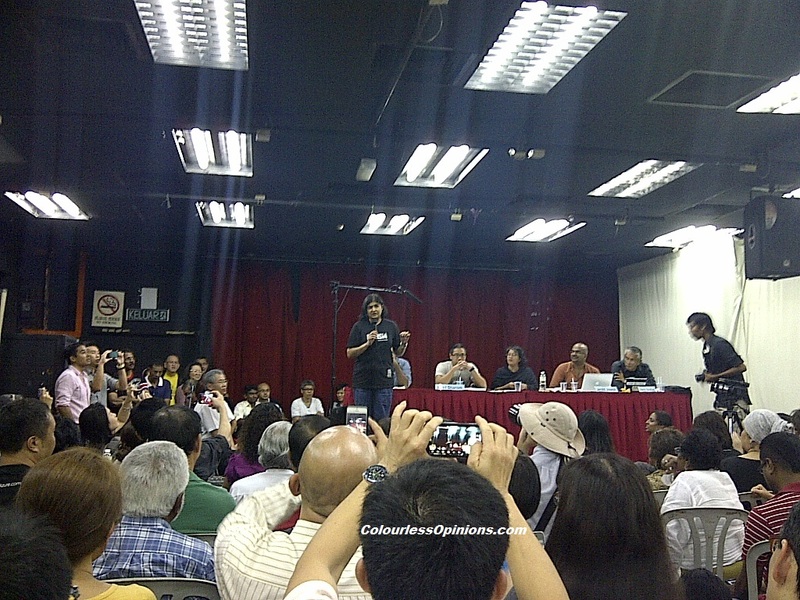 Dato Ambiga (Bersih 2.0) was also present as a guest. On whether or not BN are accepted as legitimate government, the answer was 100% no from both the panelists and the attendees. “Indelible” ink: – First the SPR (election committee) said the ink was easily washable because the bottle wasn’t properly shaken before use. And then they said they had to water the ink down for shariah compliance. Jerald Joseph enquired his friends in India and Pakistan about indelible ink in their countries’ elections and they said that theirs don’t come off for 3 to 30 days and there was never a shariah issue with it. So it’s quite obvious that SPR weren’t serious about this demand for indelible ink at all. We need to have a new election committee as the current one will never give us proper reforms. The blackouts, foreigners & results: – Haris Ibrahim and some of the attendees at the forum shared that there were indeed Bangladeshis caught voting, there were indeed results that did not tally with the numbers of the PACA’s (Polling Agent & Counting Agent), and there were indeed actual reports that FRU were escorting foreigners to vote at some polling centres. But the blackouts (or electricity cuts) may not be true as there isn’t any credible reports on that yet. One of the PACA’s in Bentong were present and clarified that even if the lights did go out, it shouldn’t had mattered but the problem was that the SPR refused to release Form 14 (as long as it is not agreed and signed by both parties in the tallying centre after counting the ballots, results can be easily changed). So what can be done now by us? “In this one month, don’t ever give up hope,” said Dato Ambiga. She and the panelists emphasised that the frauds and disregard of the Election Offences Act committed by BN were so overt and obvious this time that there will definitely be enough credible, verifiable evidences to be brought to the people’s tribunal court to legally challenge for by-elections to reclaim the government. But it has to be done now, if possible, before the parliament comes into power. And while doing that, we could show these evidences to the people in rural areas that do not have access to the internet. Those who have evidences in a form of documents or visuals that might help, please send them to jompantau@komas.org. Final remarks by the panelists: Black is officially the new yellow, even to Bersih. Wear black as often as possible until this fight is over. Boycott mainstream media like Utusan, The Star, NST, Berita Harian, etc. Will there be a Bersih 4.0 rally? No plan for that at all yet. The Bersih 4.0 Facebook Page and Event are unofficial (obviously) so just ignore them. If we took the streets now without hard evidence, we would look like irrational fools. We must have a re-election…present party had played dirty n full of corruption..Ubah…Reformasi. How about postal votes and traceable public servants votes? are there any irregularities in the process? @Anonymous It was discussed a bit and suggestions were given on the floor. You can watch the whole forum in the video above.